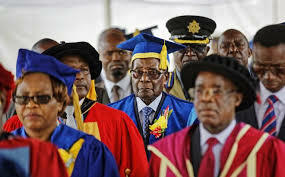 President Robert Mugabe attended a university graduation ceremony on Friday, making his first public appearance since military generals took control of Zimbabwe earlier this week. In a display of defiance, Mugabe, 93, arrived at the ceremony in the capital Harare, dressed in a blue academic gown and tasselled hat, an AFP correspondent reported. The generals took over late on Tuesday after vice president Emmerson Mnangagwa was sacked and Mugabe's wife Grace emerged in prime position to succeed her increasingly frail husband. Zimbabwe was left stunned by the military intervention sparked by the bitter succession battle between Grace and Mnangagwa, 75. Analysts say the military leadership was strongly opposed to Grace's rise, while Mnangagwa has close ties to the defence establishment. Mugabe and the army chiefs held talks on Friday as the takeover appeared to signal his imminent exit from office after 37 years in power since Zimbabwe won independence from Britain in 1980. Mnangagwa, who is a leading candidate to succeed Mugabe, flew back to Harare on Thursday after fleeing the country when he was sacked last week.